Well I've got some bad news, last Monday morning when I went out to let the girls out, Lillian crowed....twice! Not really bad news but not what I wanted to hear at 6:30am. I then took a better look at some online photos of her breed. The males have the same large comb and wattles that she does. 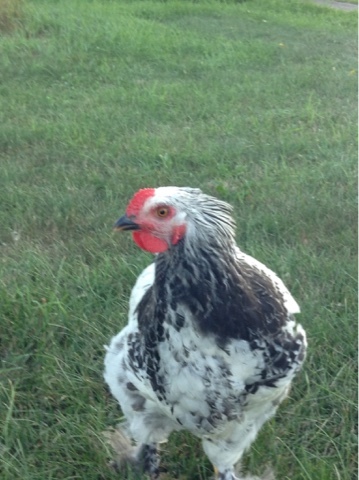 The females of her breed have the same small comb and wattles that the other girls have. So Lillian is now Bert, for now anyway. Since she was named after my Grandmother and that does not work for a rooster, I used my Grandfathers name, Albert, but he was called Bert. But I'm not sure if Bert in a good fit for him. Time will tell. After reading more about the hierarchy of a flock, they will have one dominant rooster at the top and that is just what Bert has been. A few friends have asked what I'm going to do with him...well for now I hope he turns out to be a good protector for the girls. I didn't want a rooster, but now that I have one, so far so good. Now to add to my chicken obsession....I have four new baby chicks coming on September 20th...how exciting is that! I'll tell you more about them soon. 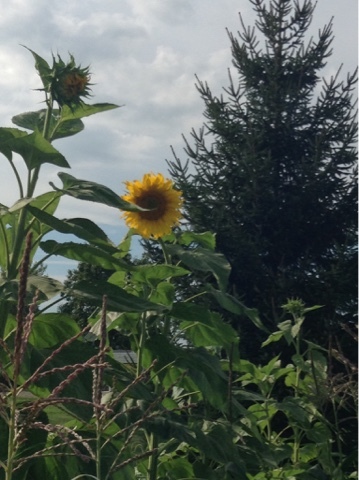 I leave you with a picture of my first sunflower that opened a couple days ago. They are about 8 feet tall!